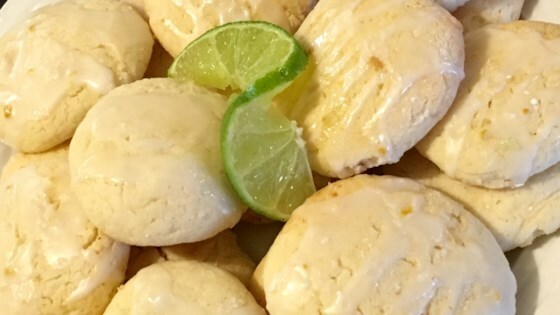 "Light and fluffy spongy cookies with a lemon-lime flavor are sure to become a favorite." Combine flour, baking powder, and salt in a mixing bowl. Beat non-dairy butter and sugar together in a separate bowl until light and fluffy. Add egg, cottage cheese, 2 1/4 teaspoons each lemon and lime juice, and 1/2 teaspoon each lemon and lime zest. Add to flour mixture; mix well. Flour hands to keep dough from sticking. Scoop out tablespoons of batter and roll into balls. Place on prepared baking sheet and slightly flatten. Bake in preheated oven until edges start to lightly brown, 15 to 17 minutes. Cool completely before glazing. Mix powdered sugar, 2 1/4 teaspoons lemon juice, 2 1/4 teaspoons lime juice, 1/2 teaspoon lemon zest, and 1/2 teaspoon lime zest together in a small bowl. Drizzle or brush over cooled cookies.